If you don’t know where the Pelion is or why you should go there, then you need to read my previous article about untouristy Greece first. If you just want to know about the food, keep reading. The two products that come to mind when I think about the gastronomy of the Pelion region are, without a doubt, the tsipouro and the fruit preserves. Tsipouro is a liquor obtained from the distillation of grape marc, similar to the Greek ouzo or raki. It comes both with or without anis flavour, and is served in a small shooter glass with every meal (except breakfast…I think) as a kind of aperitif, to stimulate appetite. Just like ouzo you can drink it straight, on ice, or mixed with water. 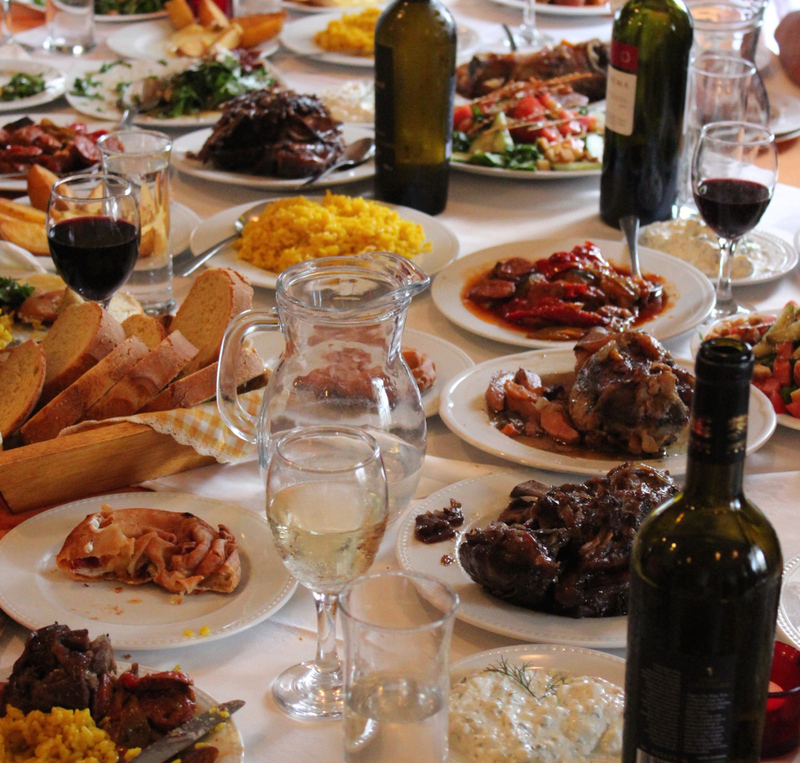 It is closely interwoven with Greek lifestyle, hospitality and entertainment, and a meal requires several clanking of the tsipouro glasses while saying “yiamas” (meaning “to your health”). 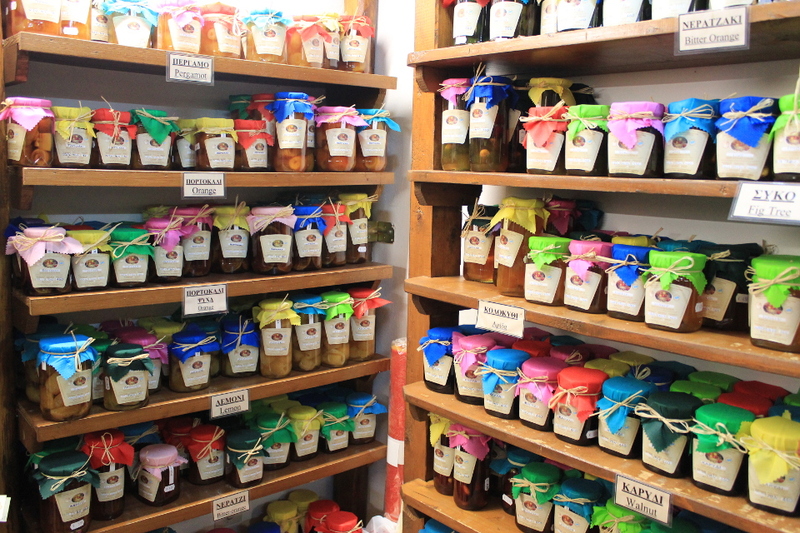 The fruits preserved in syrup (gliko koutaliou) are ubiquitous throughout the region and some shops display rows upon rows of these jars, containing various fruits such as apricots, pear, apples, and many others. The syrup is thick and very sweet, and the texture of the fruit is somewhere between canned and candied. They constitute very good toppings for Greek yoghurt. 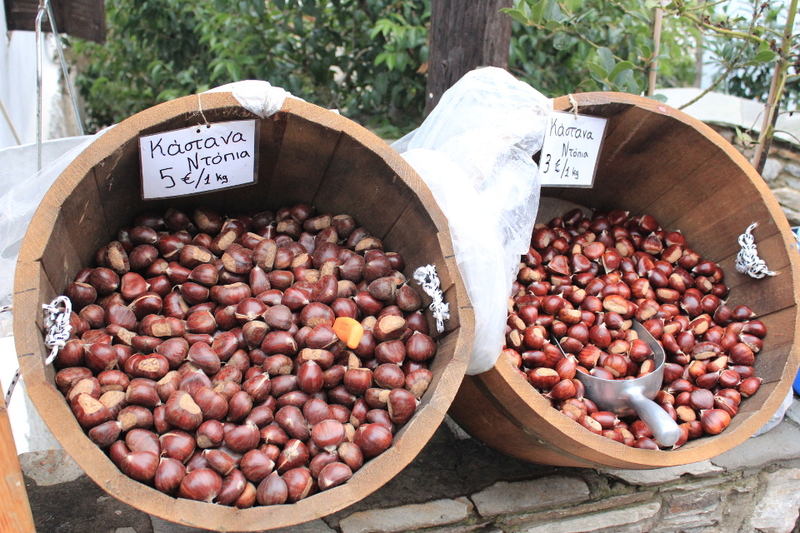 Many of the villages are also known for their apples (Zagora in particular) and chestnuts. On the coast, where it’s warmer, you also find crops of oranges, lemons, potatoes, tomatoes, capsicum, and more. Olives of course are everywhere! 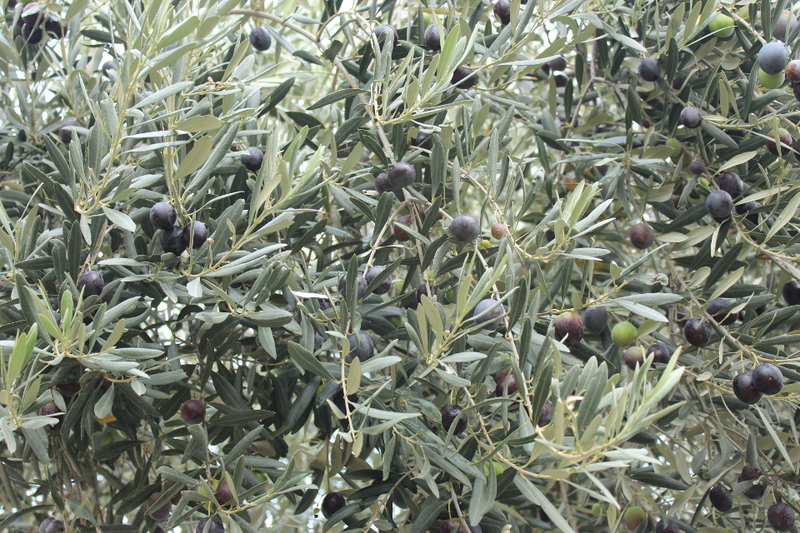 Harvest season is November, and at the end of October we could already see a lot of olives in the trees. Did you know that you shouldn’t eat olives right off the branch as they are very bitter? They must me soaked in salty water for several months before becoming edible. Greece produces 29 kinds of olives, one of which is the Pelion olive. As well, Greece is home to 6000 types of plants (1000 of which are endemic) due to its many micro-climates (deep gorges, islands, and so on). Mount Pelion has the greatest concentration of medicinal plants in Greece. The mythical Centaurs are thought to originate from here, and according to legend, one of them, Chiron, was tutor to the God of Medicine. 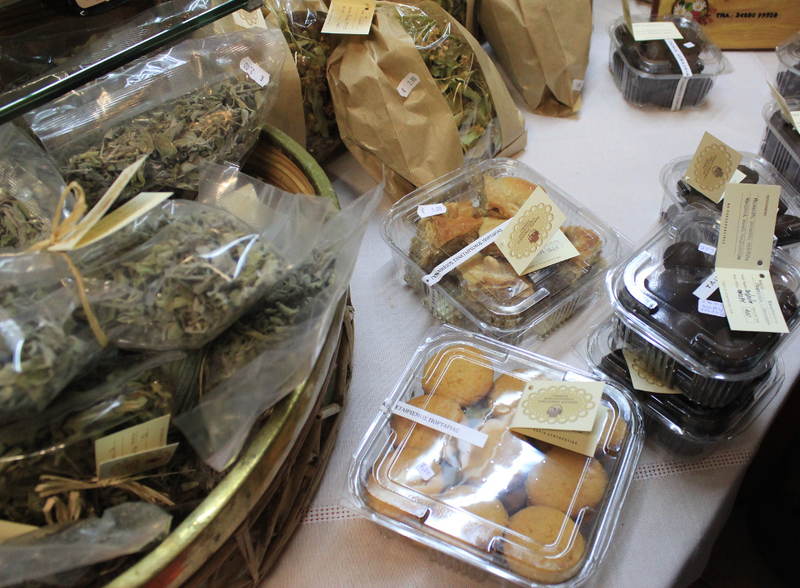 You will see shops selling various herbs and spices around the villages. Some villages such as Portaria and Zagora have Women Cooperatives that produce traditional sweets, jams, fruit preserves, and pastas, as well as non-food handicrafts like knits and lace. 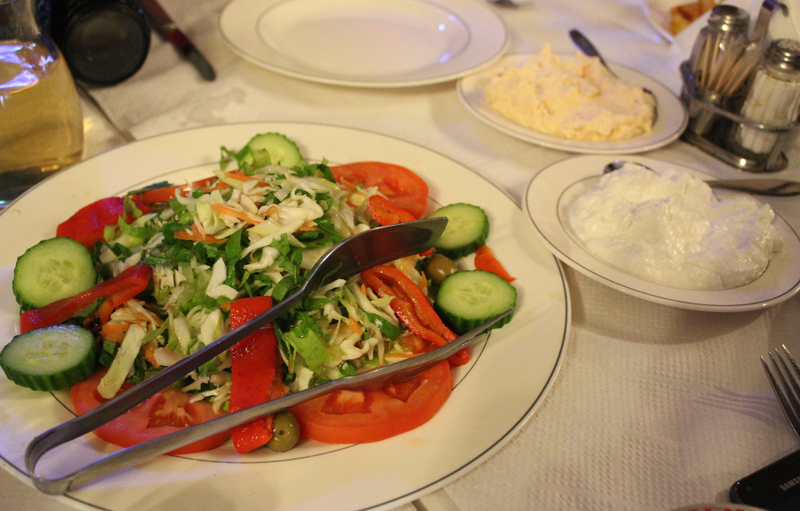 The one in Zagora prides itself on using no preservatives. If you like to sit down and have your food prepared for you, that’s no problem. You can find several cafés and restaurants, usually on or around the central village square. Some even have fireplaces for cooler days. 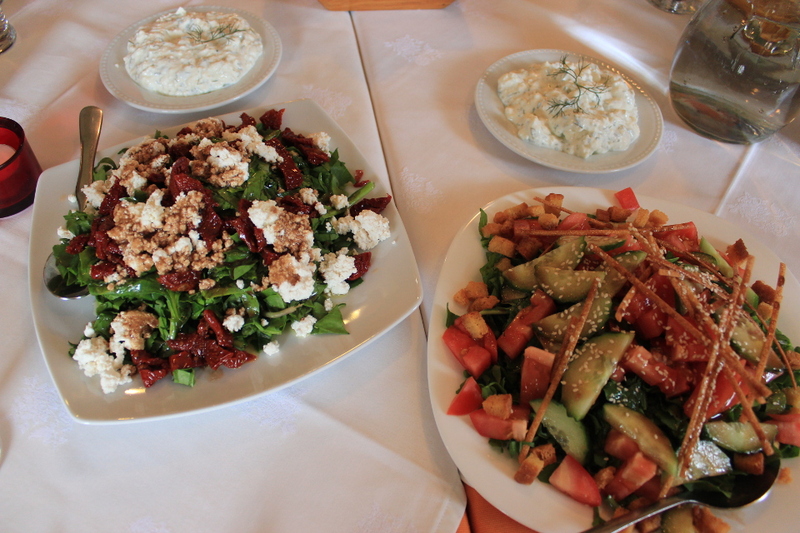 If there are several of you, order multiple appetizers and main dishes to share. This is what our group of 16 did for most of our meals. Our two guides would pre-order the food and we just had to dig in! 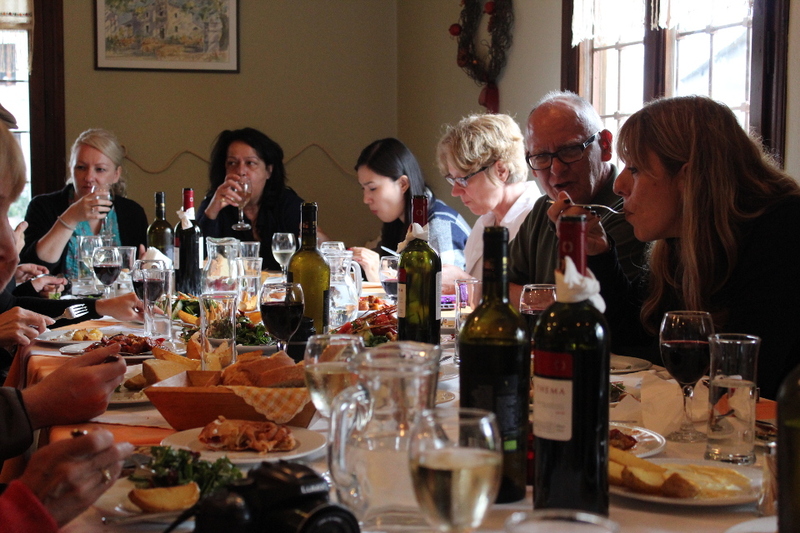 In a typical meal the tsipouro comes first, followed by the appetizers (mezes) and wine. 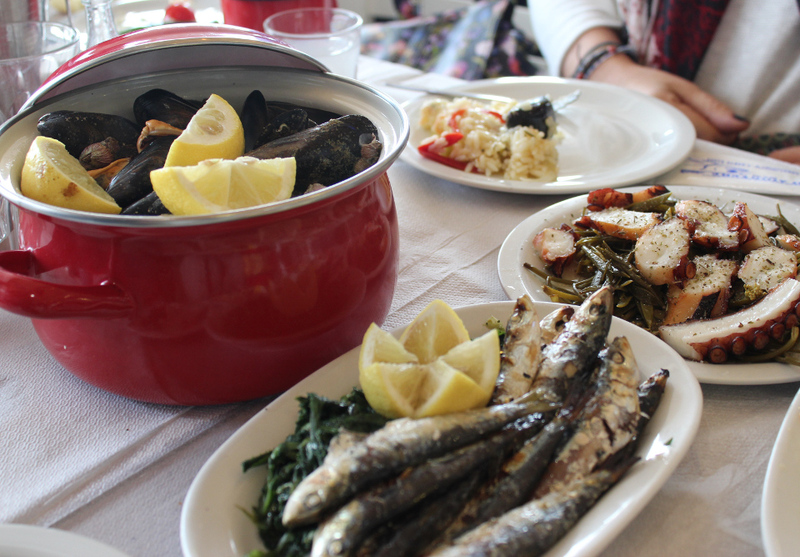 At Dionysis in Volos, we were served many seafood mezes including calamari, steamed mussels, shrimps, and little fried fish. 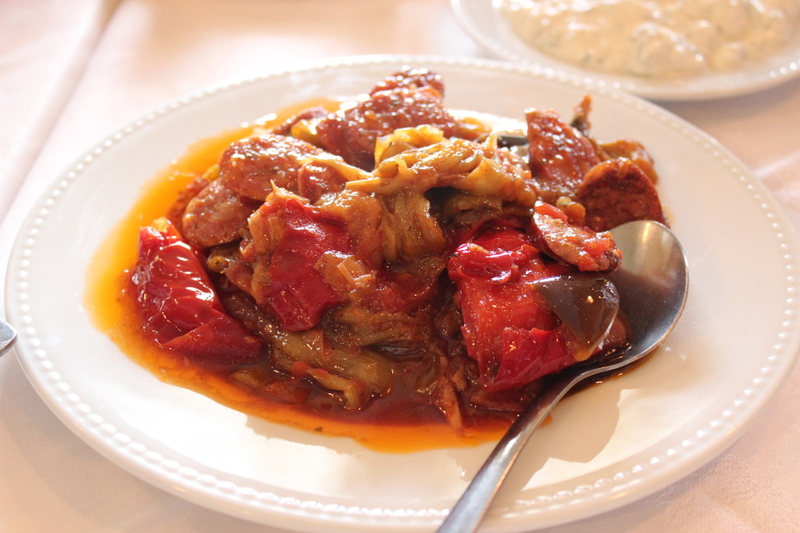 Our mezes at Agnadi in Tsagarada included beautiful mixed salads, potato wedges and stewed peppers with sausage. 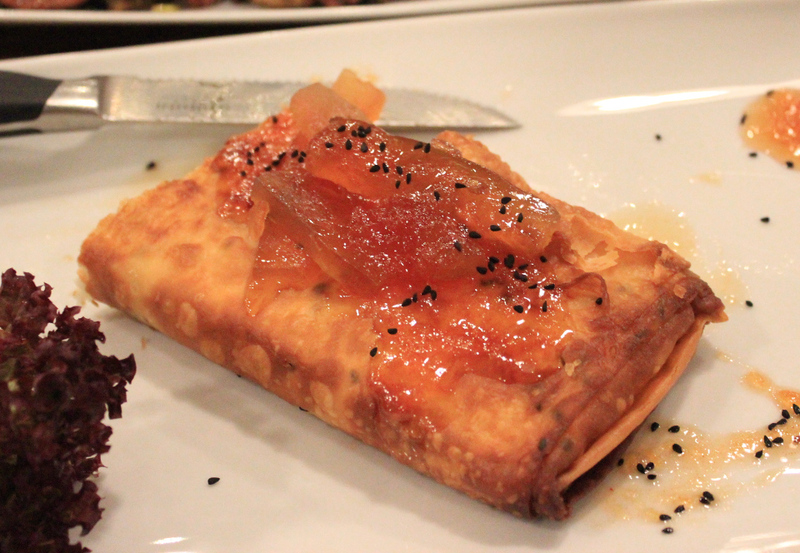 K.X.1948 in Volos brought us a delicious chunk of fried cheese adorned with fruit preserves (much better than it sounds). Other common appetizers include a dip made of feta, yoghurt and herbs, as well as pieces of zucchini floured and lightly fried in beer and olive oil (almost like tempura). You can easily make a meal just with mezes. 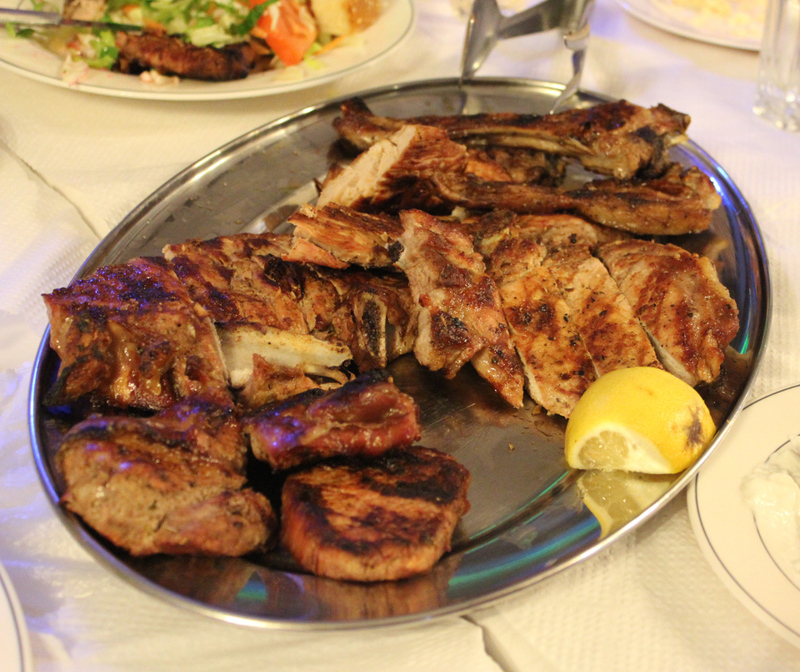 However we always got main courses too, which consisted mostly of meat (chicken, lamb or pork) accompanied by potatoes or rice. What about dessert you ask? I do remember some cake (with apples, or chestnuts of course) but by then I was too stuffed to eat more than a few bites. You can see the feasts we had by looking at the photos! 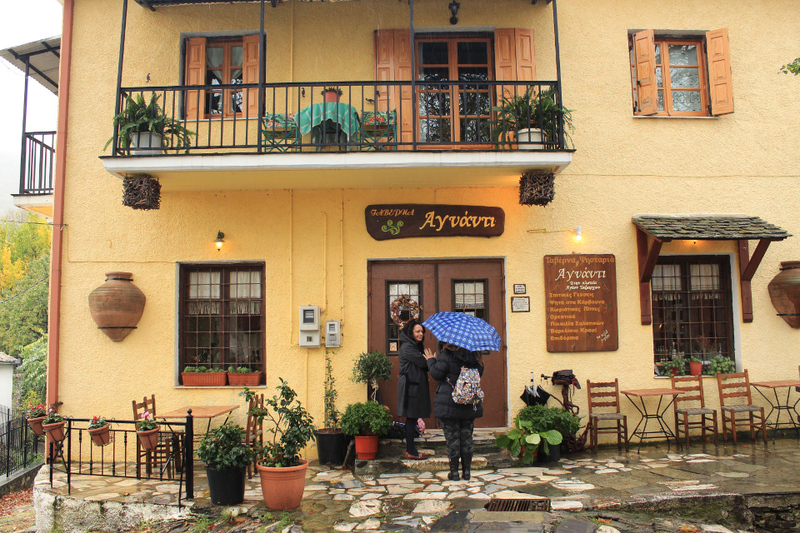 According to Yargos (from Stamou Boutique Hotel in Zagora), you can eat and drink for about 15 € per person in the Pelion villages. Of course, if all you want is coffee and a piece of cake, you can get that too! Besides Greek coffee, you can order a latte, a cappuccino, or even hot chocolate. 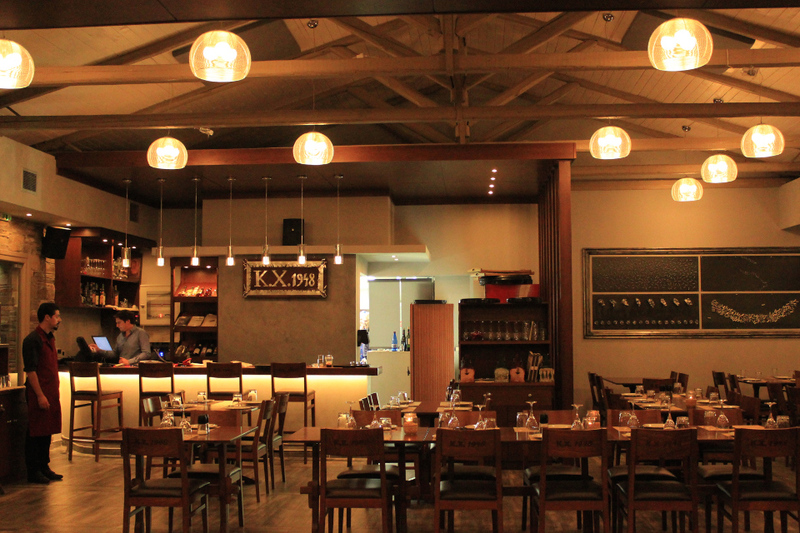 One night in Volos, our restaurant K.X.1948 featured a live band, and our guides encouraged us to dance “greek style”. I didn’t notice any of the locals dancing, but apparently it was too early. 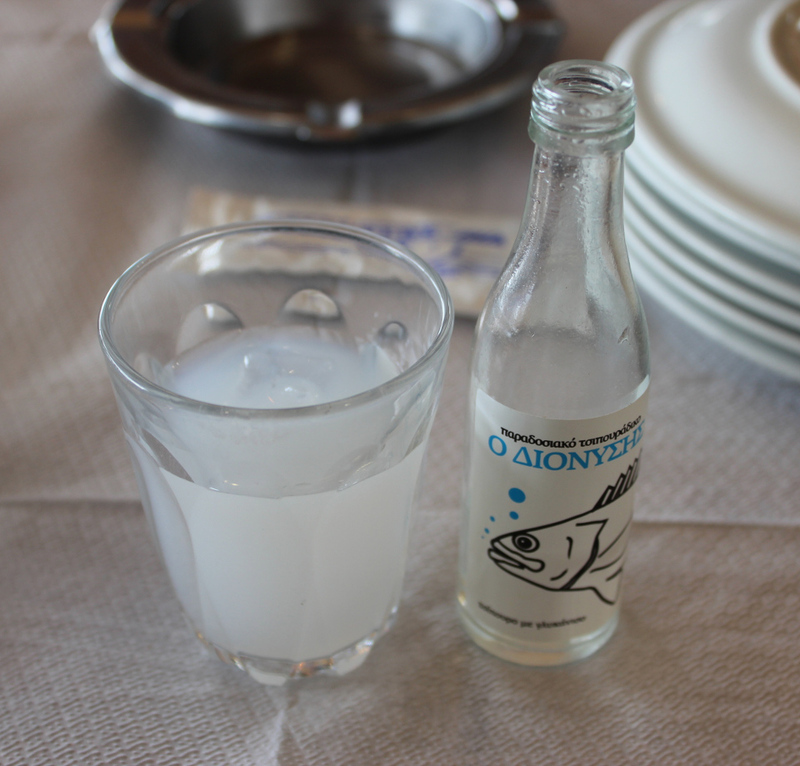 I assume more tsipouro had to be consumed first. Yiamas! My 3-day trip to the Pelion was sponsored by the Greek National Tourism Organization. However all opinions are my own.